DARREN SMITH, London, UK, currently heads the Credit Structuring team at WestLB. He has over 12 years' experience in the cash CDO market, and has executed numerous transactions in asset classes as diverse as loans, bonds, emerging market bonds, asset backed securities, CDOs and credit default swaps. Prior to WestLB Darren worked in CDOs at PaineWebber, UBS, and was co-head of CDOs at Dresdner Kleinwort. He has spoken at numerous conferences including the Global ABS Conference, Barcelona, and CDO Europe conferences sponsored by Opal. Darren holds a bachelor's degree in Electronic Engineering from the University of South Australia. PAMELA WINCHIE, London, UK, is currently a Managing Director at Cross Point Capital, London. Prior to this Pamela held positions as a Director in the European CDO group at Barclays Capital, and a Director in the CDO group at Dresdner Kleinwort. She has over 10 years' experience both as a cash CDO structurer and as a lawyer involved in corporate, securities and securitization law. She has modelled and structured numerous CDOs in various currencies with a range of underlying assets and has spoken at a number of conferences including the CRE-CDO Summit, London, the European CDOs & Credit Derivatives Conference sponsored by IMN and the International Structured Product Conference. Pamela holds a bachelor's degree in Mathematics and Statistics from the University of Western Ontario and a Juris Doctor from Osgoode Hall Law School. 1.1 To Excel or Not to Excel? 1.2 Existing Tools and Software. 2 What is a Cash CDOs? 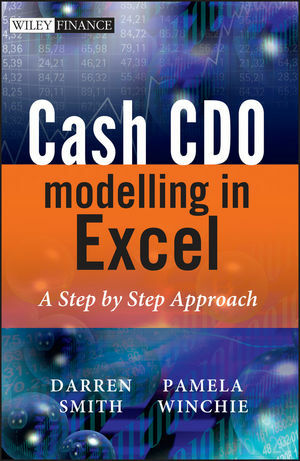 2.2 Description of a Cash Flow CDO. 2.3 Life Cycle of a Cash CDO. 2.4 Contribution to the “Credit Crunch”. 3.2 Modelling Philosophies and Trade-Offs. 3.4 Organization and Layout of a Model. 3.5 Life-Cycle Issues: Building an Adaptable Model. 4 Prerequisites to Cash Flow Modelling. 4.2 Interest Rate Curve Modelling. 5.1 Create the Input Sheet. 5.2 The Value of Labelling. 6.1 Initial Asset Pool: Rep Line Modelling vs. Actual Assets. 6.2 The Collateral Sheet in the Cash Flow Model. 6.3 Modelling Defaults and Recoveries. 6.8 Timing Models vs. Actual Timing. 7.4 Timing Modelled vs. Actual Timing. 7.6 Fees and Expenses Cash Flows. 7.8 Interest Waterfall (Available Funds after Payment). 7.11 Principle Waterfall (Available Funds after Payment). 7.14 Adding Interest Coverage Tests. 7.15 Technical Issues with Coverage Tests. 8.1 Purpose of the Outputs Sheet. 8.5 Weighted Average Life and Internal Rate of Return. 9 Moody’s Rating Agency Methodology. 9.1 Introduction to Agency Methodologies. 9.4 Creating the Moody’s Sheet and Related References in the Cash Flow Model. 9.8 Variations on the BET. 10 Standard & Poor’s Rating Methodology. 10.8 Additional S&P Modelling Criteria. 10.9 Building the S7P Sheet and Related References. 10.10 Running the Stress Scenarios. 11.8 Collateral Manager Equity Analysis. 12 Maintaining the Cash Flow Model. 12.1 Adapting Your Model for Different Capital Structures. 13.2 Collating Collateral Cash Flows. 14 Sourcing and Integrating Data From External Systems. 14.4 Loan Level Information Sources. 15 Regulatory Applications of CDO Technology. 15.2 Regulatory Capital Requirements for CDO Notes. 15.3 The Standardized Approach for CDOs. 15.4 The Internal Ratings-Based Approach for CDOs. 15.5 The Internal Ratings-Based Approach for CDOs: The Ratings-Based Approach. 15.6 The Internal Ratings-Based Approach for CDOs: The Supervisory Formula Approach. 15.7 The Internal Ratings-Based Approach: Liquidity Facilities, Overlapping Exposures, Credit Risk Mitigation and Early Amortization Features. 15.9 Updates to Basel II. 16.4 Fundamental Cash Flow Analysis. 16.5 Using Rating Agency Models.